Kelsale church is probably a thousand years old being first mentioned in the Domesday Book (AD1086). Most of what we now see in the church is the work of Victorian restorations particularly during the “Arts and Crafts Movement” period. The church can be seen from a good distance, particularly on a winter’s night when the cross of top of the tower is illuminated. 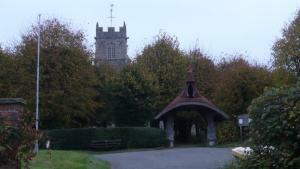 The Lych Gate is the first sight as you approach the church up the hill from the village hall. The Lych Gate was designed by E.S.Prior and given by the Rector George Davies in memory of his first wife. The church is dedicated to St.Mary and St.Peter. The church is unusual in that the Tower is at the west end of the south aisle. This is because a new large nave was added to the north of the existing church in the 14th century. The south Porch was added in the 15th century and in the 19th century the south aisle was extended to provide a reading room, intended for the education of children during the services and a place where they could be looked after to allow the parents to concentrate on the service and the sermon! As you enter the church through the heavy oak door with its massive iron knocker, one is struck by the large open space at the west end lit by the large west window. The font sits here and is of a typical Suffolk design although the proportions are much different from others of this design. Behind the font and standing against the west wall is the former reredos which was installed behind the altar in the 1870’s by Norman Shaw. It was removed because it cut off much of the light from the East window, firstly to the side of the chancel and then to its current position. In the nave, features to look for are the Jacobean pulpit which served as a pattern for the pulpit in Aldeburgh church, an oak lectern given as a memorial to a soldier of the First World War and the “pews”. These are oak benches designed by E.S.Prior. The screen between the nave and the chancel was designed by Prior, look for the “rood group” above the screen. Glass in the nave includes designs by the Pre Raphelite Brotherhood for example William Morris, Ford Madox Brown and Edward Bryne-Jones. The tower contains a ring of eight bells with the ringing chamber on the ground floor at the west end. The bells are still rung for special occasions such as weddings, or when visiting bands of bell ringer’s visit. In springtime the churchyard is a riot of the colours of wildflowers, carpets of bluebells and the Fritillaries being particularly notable. The churchyard is managed as a wildlife habitat which shows with the numbers and varieties of birds, flowers, butterflies, moths and other insects which are found here.